One of my earliest known memories is of flowers. 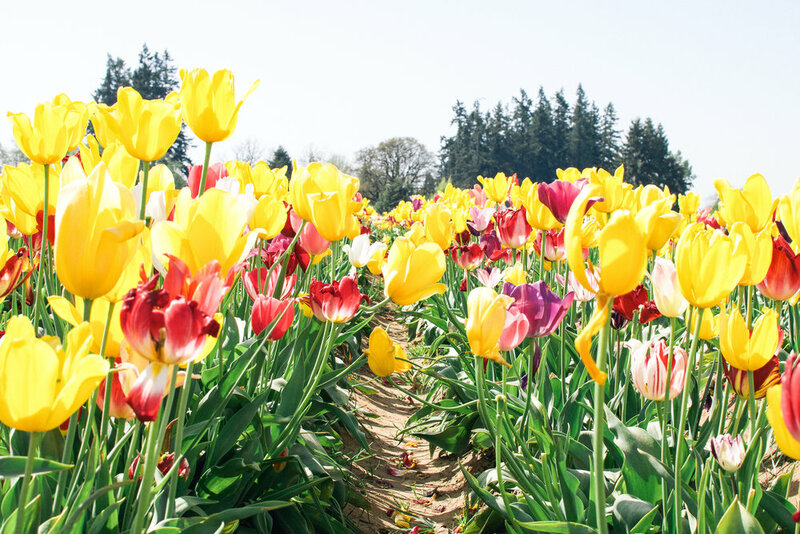 When I was a kid there was this patch of yellow and red tulips in the front yard of our West Linn house and I remember always being drawn to them. And thus began my love for flowers. Going to the local nursery with my mom and getting our picks for the season, planting them, pulling weeds, watering, fertilizing, pulling more weeds, and over the course of the summer watching our yard turn into a little paradise. 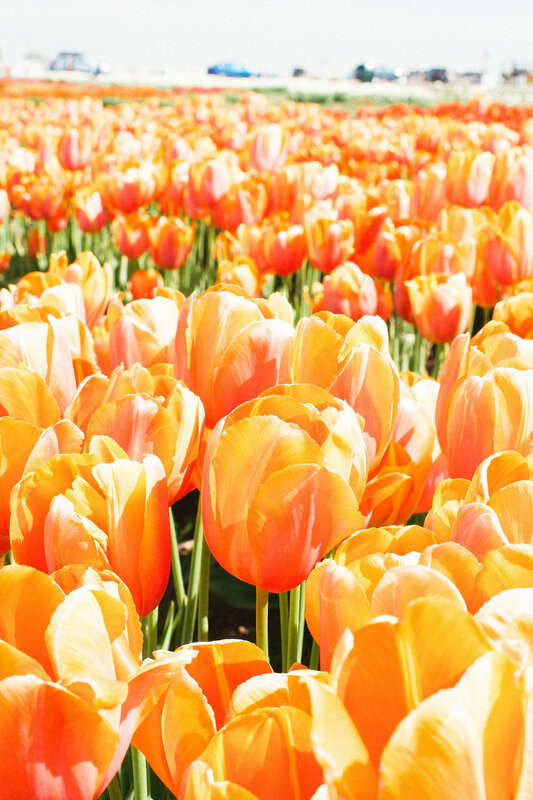 And oh how sweet the tulips always were! Their beautiful symmetry and bright colors, their endearing promise that summer was on it's way, and their reliability; put them in the ground and you're sure to watch them grow. And then spring took on a whole new meaning for me four years ago when my darling Evangelene, "Evey" for short, came into the world right in the thick of it. Mid March, a perfect time to be born, especially in the Willamette Valley! Between the camellias, lilacs, crocuses, daffodils, and tulips (to name a few) we have no shortage of reminders that we made it through the rainy season, yay! 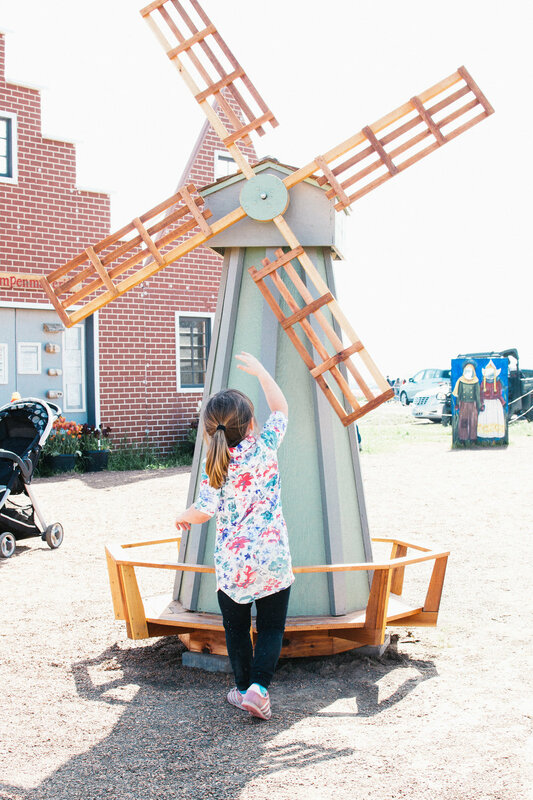 This year we definitely had our fair share of rain so what better way to celebrate than heading to the Wooden Shoe Tulip Festival in Woodburn? And who better to go to it with than Evey and my mom? (Thanks for the idea Mom!) 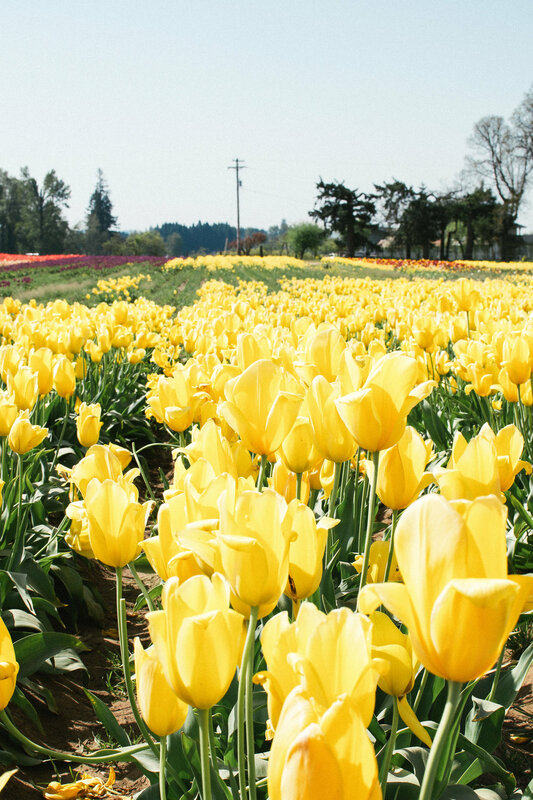 So on Wednesday we trekked an hour north to the Wooden Shoe Tulip Farm to check out their annual tulip festival. Let me tell you, it did not disappoint! There was so much eye candy! 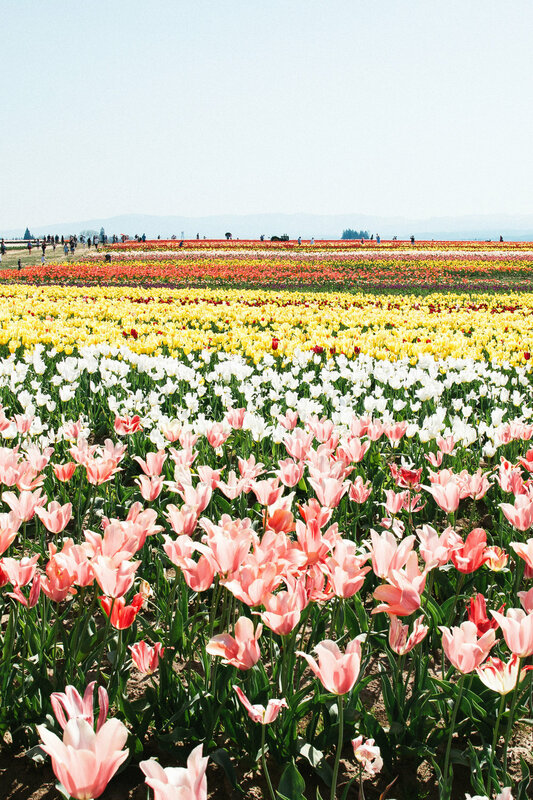 Forty acres of brilliant color, Mount Hood hanging perfectly in the background, and darling dutch accents, all nestled within the farms and vineyards of the surrounding area. One thing I wasn't mentally prepared for was the festival aspect; bounce houses, pony rides, elephant ears... you get the idea! All my parents out there will understand, although it's really fun to take your kids to those type of events they aren't exactly relaxing for you! 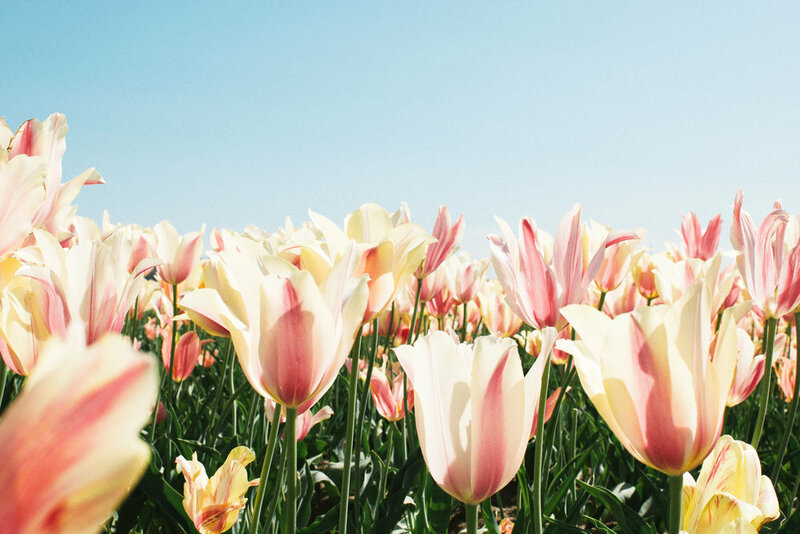 With this being my first time out there I had pictured walking the fields, checking out the gift shop, and coming home with a few bunches of tulips. Which I did get a chance to do all of that but we also took a few breaks for shaved ice and rubber duck races. It was neat though to see all the kid friendly activities, next time I'll make sure to bring Adlai and Collin along. And then go back with just my mom! All in all this was an incredible, joyful experience. Flowers are so life giving and such a blessing! Next year I'm hoping to go on a clearer day, figure out how to better edit such intense and saturated colors, and maybe try harder to not have a million photoshoots happening in the background of my pictures! To be fair, I was warned that it was one giant photoshoot (understandably) and I'm not shying away from the fact that I was one of those people out there with my camera crouching down amongst the flowers.